Don’t just take whatever cash is in the bank! Many limited company directors rely on dividends from their company as the main source of income, after taking a small amount as salary. However, the amount that can be taken as dividends is NOT the same as the cash held in the bank, and it’s easy to take too much. When you do the excess is commonly called ‘illegal dividends’. To avoid this scenario, you should use your management information, such as quarterly P&L reports, to establish what the maximum dividend amount is, after making allowances for VAT or Corporation Tax liabilities. 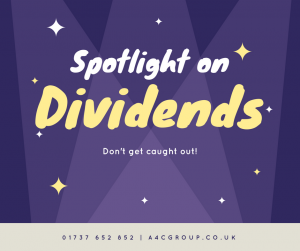 If you have an accountant then they should be able to help, and certainly at a4c we send these reports to clients as standards to help avoid illegal dividends being taken. Remember that dividends are the share of profits, after taxes, to shareholders in line with their individual shareholding. If the dividends withdrawn exceeds the amount of available profits then the excess is described as illegal. What happens if you take an illegal dividend? Declaring illegal dividends is not a criminal offence, so you won’t go to prison. However, if you failed to take reasonable care, by failing to check available profits, then you may be responsible for repaying that dividend to the company. If you find yourself in this situation then the solution is to simply repay the money to the company. Or treat the excess as a director’s loan. Remember that director’s loans may be subject to s455 tax (at 32.5% of the debt) and could be classed as a benefit in kind, unless a competitive rate of interest is charged. The best approach to dividends is to review available profits on a regular basis and keep up with dividend paperwork, so that HMRC has no opportunity to challenge that excess funds withdrawn were actually salary payments (with the associated tax and NI costs owed). It is more important now than ever before to carefully plan your dividend strategy, especially as the current £5,000 dividend allowance is due to decrease in April 2018 to £3,000. The result of this will be a higher personal tax bill, making planning essential to avoid any nasty and unexpected tax bills.